The Pork Checkoff has awarded 21 scholarships to college students around the United States as part of its strategy to develop the pork industry’s future leaders. A National Pork Board committee judged the pool of 70 applicants based on scholastic merit, leadership activities, involvement in the pork production industry and the applicants’ plans for a career in pork production. “The 2018 scholarship winners are an important part of the pork industry’s future,” said National Pork Board President Terry O’Neel, a pork producer from Friend, Nebraska. This year’s top scholarship recipients are Madison Wensley and Amanda Anderson, who will receive a $5,000 and $3,500 scholarship, respectively. Wensley, a senior at Michigan State University, is majoring in animal science. She plans to continue her academic career by pursuing a master’s of science degree in swine nutrition at Kansas State University. Ultimately, she would like to provide pig farmers with the tools they need to improve feed management practices. 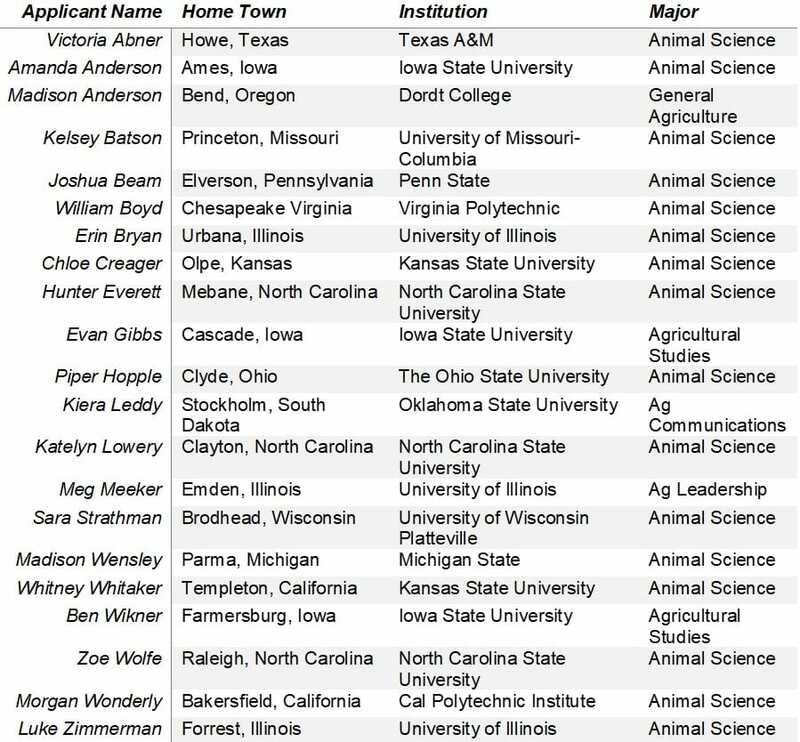 Anderson, a senior at Iowa State University, is majoring in animal science. She plans to pursue a doctorate of veterinary medicine at Iowa State University in the fall. The other award recipients will receive $2,000 each. “We are excited that these young people see the opportunities available in today’s pork industry,” O’Neel said.